Your adventure starts at the famous Olympic village at Lake Placid, home of the US bobsleigh team and other sporting heroes. Starting out winding your way on lovely forest trails will then bring you to the trailhead for Mount Marcy – the highest point of New York State and the jewel in the crown of the Adirondack High Peak Wilderness Area. Making your way up and over the summit is the only way to access the source of the Hudson – the tiny Lake Tear of the Clouds, nestled in the shadow of Mighty Marcy. The hiking is great – a steady uphill on a well-marked trail through forest, until at last you exit the treeline into the Alpine zone for wonderful views across the entire Adirondack Range. Descending to Lake Tear is tricky – it is steep and rocky and concentration is key. From there, you will continue your thru-hike to the southern trailhead at Upper Works, all the time following the headwaters of the Hudson as they crash and tumble down the mountain, with names like Calamity Brook accompanying a soundtrack of waterfalls, rapids and forest wildlife. As you exit the hike at Upper Works, you will make your first transition to bikes. Prepare for a smooth and serene ride down Tahawus Road until you hit the 28N, which will take you all the way to the village of North Creek. It’s little lumpy in places (up and down) but these are all ‘rollers’ and fairly short climbs; nothing Tour-de-France King of the Mountains-style. It is will of course be tough on the legs after the hours spent on the hike. Take it easy, sit back into it and hoover up these initial miles before a well earned plate of something hot and a sip of something cold at day 1 journey’s end. A comfy night’s sleep and an early start brings you face to face now with the biggest mileage day. The day starts out very much like it finished on day 1 – some short hills to go up and down which eventually bring you out of the ADK mountains as you head downhill towards Lake George. A stop for ice cream or even second breakfast perhaps awaits in this charming lakeside town, before heading onwards towards Glens Falls, South Glens Falls and a lovely chunk of old Americana that lines the Highway here. The scenery changes now and you leave behind the forested hills to give rise to more open farmland. it’s all pretty flat now (or gently sloping downhill) and it makes for fast, fun riding through diverse and engaging country. You will cross the Hudson itself many times, or have it adjacent to you, really connecting you to this journey along its course. As you continue south you will pass through the city of Troy and then make your way back to the banks of the river itself – now riding right next to it for miles, until finally you make your way into the quirky little upmarket town of Hudson, where today’s route ends. You might be ready to give the bike a rest today after the miles you have covered and after a lovely morning’s ride, including highlights such as riding through the charming town of Rhinebeck and then past the Vanderbilt Mansion and Roosevelt’s house, you will arrive in Poughkeepsie, ready for a totally different challenge. Now it’s time to take to the might river itself. At this point the Hudson has blossomed from a tiny brook gurgling in the mountains to a rather large river, which is also tidal. From our put-in under the shadow of the huge Poughkeepsie bridges (including the awesome Bridge over the Hudson footbridge), we will make our way downriver into the heart of the Hudson Highlands, arguably the most scenic part of the entire river. Our first stop is Beacon, where you will be able to put in for a quick rest stop and some food and drink. From there you continue to head south, until the surreal sight of Bannerman’s Island comes into view in the middle of the river. The island contains old abandoned structures, built in the style of a Scottish castle. Very eerie and really cool. Past the island and the famous military academy of West Point can now be seen on the western bank of the river. We pass a couple more bluffs and finally we arrive at the pretty little outpost of Cold Springs, where we will put ashore for one final night on the trail before our triumphant arrival in New York City the following day. The day begins with the hilliest part of the entrie route, believe it or not. State road 9W is well known to cyclists in the NYC area and we will cross the stunning Bear Gates Bridge into Bear Mountain State Park, before riding 9W down the west hand bank of the Hudson all the way into Jersey. Our final cycle will feel like we are sneaking up on the city as we enjoy almost traffic-free riding all the way to the George Washington Bridge. That is quite a feat given how built up the landscape is at this point! Then, as if by magic, we pop out at our final transition in the shadow of the bridge and there is the Big Apple, laid out before us in all her glory. A quick change back into running gear and we find ourselves preparing to finish this challenge the way we started – on foot. 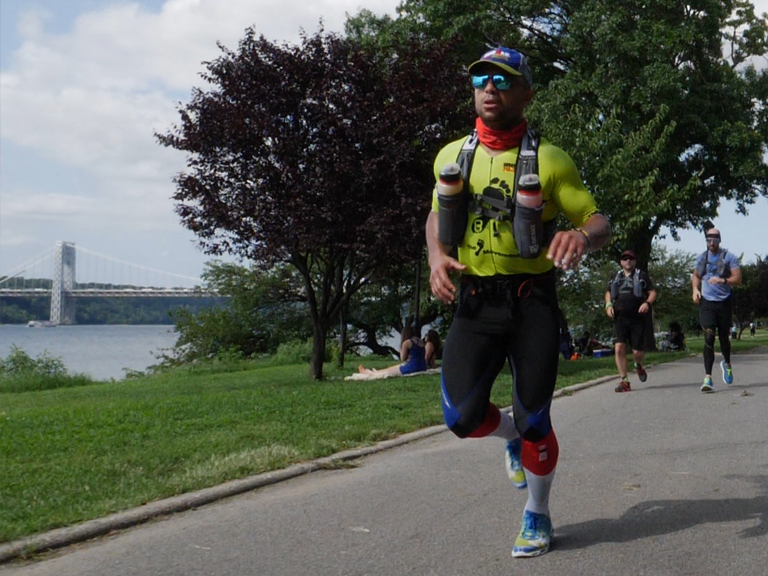 We will run across the bridge and make our way onto the fantastic Hudson River Greenway that runs all the way down the west side of Manhattan, routing through parks, over boardwalks and all on traffic-free sidewalks or trails. The Hudson itself, now a mile wide is right there the whole way – we are right next to it for the best part of 13 miles – until we arrive at our final destination. Mile marker zero of the Hudson River is where we complete our journey, amid the skyscrapers of the Financial District and with lady Liberty shining bright in the distance. Wow. That was some adventure! Yes.Rat Race are a responsible and experienced operator of adventure challenges of some 15 years experience. We operate globally in challenging and remote environments, as well as in city downtowns. We cut our cloth to suit any plan accordingly and this event is no exception. With a serious commitment to safety throughout the course, you’re in safe hands out there. Both on dry land and out on the water, a full suite of safety resources are at our disposal to ensure that you have the very best cover, whilst enjoying an amazing extended-weekend adventure. Well, 300 miles on foot, bike and boat over 4 days will never be a walk in the park! This is a big weekend on the arms, legs and in the mind. But we have designed it to be achievable. We don’t want you to fail. You need the right mind-set. It is worth a shot; it has to be. When else do you get an opportunity like this, to descend the entire Hudson River from a tiny lake in the mountains right to the very heart of New York City? Can I walk the foot section? Can I use my own kayak? If you have one, yes. We will provide everyone with the opportunity to rent one of ours but if you prefer to use your own, that’s fine. You’ll need to provide your own paddle and buoyancy aid too. Plus we will need you to demonstrate your paddling ability in it and its seaworthiness. If it’s been in the garage or the yard for years, you might want to check those skegs, rudders and rubber seals for leaks! Still, there is no requirement to use your own. We have rentals available. Oh yep and it’s fine to use singles or doubles. Your call. No sit-on-tops though please. Must be a closed-cockpit boat. 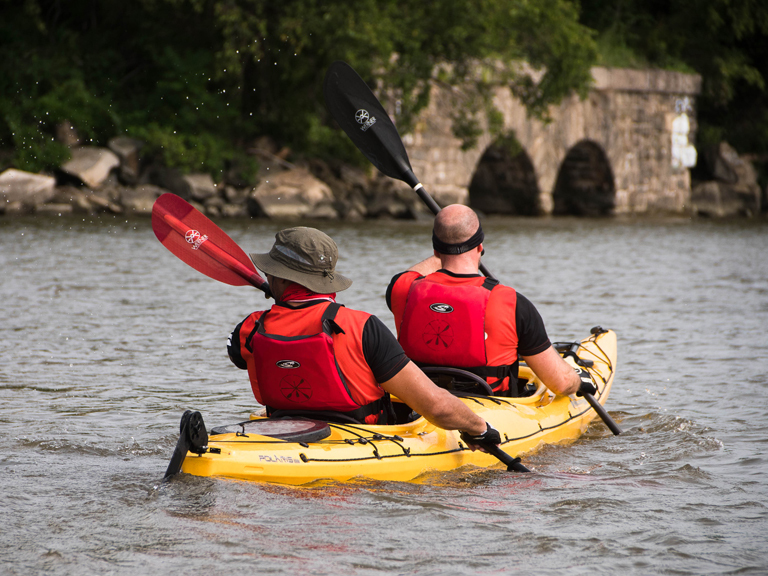 Kayaking: This is a very nice kayak stage on arguably, the best kayaking section of the Hudson – which takes you through the ‘Hudson Highlands’ from Poughkeepsie to Cold Spring. You can read more about kayaks for this event here. Not in the spirit of this one, sorry! How long have I got each day? We will have cut-offs in place throughout the challenge but these will be extremely generous. If you do find yourself at the back and off the pace, we will scoop you up and shuttle you further up the field, although we will aim for this to be a last resort so you have your best shot at doing the whole thing by your own means of travel. For the kayak stage, the same applies but it works slightly differently on the ‘scooping you up.’ Of course, we will have checked you out in the boat before you set off and if we don’t think you can cut it on the kayak, we won’t permit you to start. So in theory, if you are out there, you should be able to make it. But if you have a problem, boat-based or otherwise, we have the means by which you can seek assistance, bail and be transported onwards to the end of the stage. And if you are falling behind, we will insist on you withdrawing at one of our support locations and we will ferry you forward from there. The boats will follow later on. What if I get injured, or need to withdraw from a stage or from the whole thing? As above. Our medical team will be on hand to assist with injury and depending on the type and nature of the injury can treat or evacuate you accordingly. If we need to get to you to urgent medical attention in a hospital, we can. If you need to withdraw from the phase on land (bike or run), these are vehicle supported stages and our vehicles will move you onwards to the overnight location for that night. If you wish and if you are up to it, you may re-start the following stage the next day. On the trek, you will need to complete the thru-hike on foot, as there is no vehicle access. If it is a real emergency and you are immobilised in the mountains, we can of course effect a rescue but we really hope it will not come to that! For the kayak, the procedure is described above; we bring you ashore at one of our support hubs, then shuttle you forward to end of the stage, your boat following later. If you need to withdraw from the event as a whole, (and if you have not been transported to hospital for urgent care) then we will move you to each overnight location with the event in one of our vehicles, until we arrive at the finishline. Alternatively your supporters can collect you form one of our overnight locations or we can assist in getting you to onward transit options like the train. There are train services from some of our hubs (and nearby towns) back to NYC and other destinations, so it will be easy to get you ‘off the event’ if you require. It is important to note that withdrawals only ever go forward on the course, not backwards (i.e. We would never take you back to the start, for example). These will be situated regularly along the route on the bike and the run and will be operated out of mobile vehicles, with beverage provision, plus some energy foods. Some portable toilets or local restroom facilities will also be positioned at some of these. 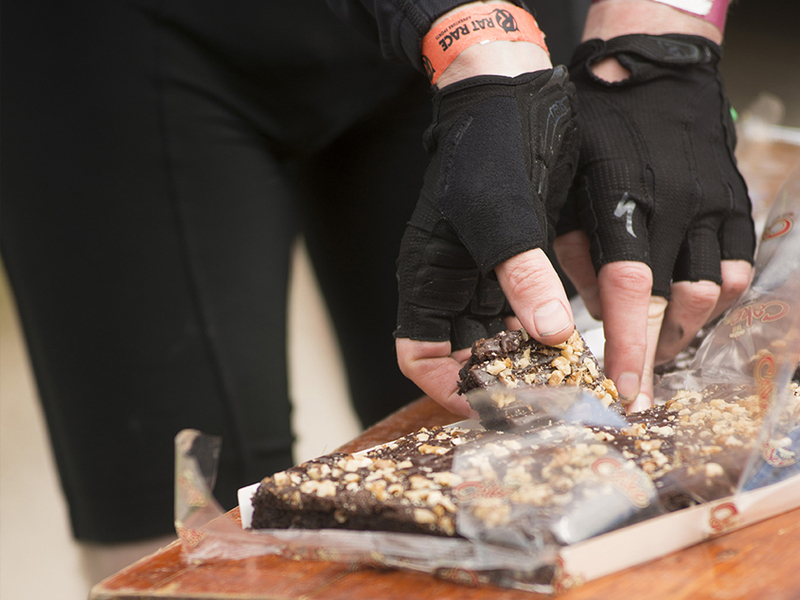 Rat Race is renowned for its pit stops – it’s all good stuff! But remember, these are not ‘full-service buffets’ and are designed predominantly as grab n’ go style offerings. Out on the water, there will be a shire-based Pit Stop at The Beacon, 13 miles into the paddle, where you can come ashore to stretch your legs and back out. You will also be able to avail of some beverages, restrooms and snacks.